It is worth recalling the event when his sister-in-law Suvasinibhabhi was bathing Ghanshyam Maharaj. She noticed various symbols on the soles of His feet. When Ghanshyam Maharaj asked what she was looking, Suvasinibhabhi replied, Baapuji has mentioned that the lines on your feet indicate you would be the king of the future. Ghanshyam Maharaj calmly replied, If that be the case, then I shall give my kingdom to your son. 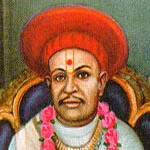 Ayodhyaprasadji Maharaj was the initial Acharya of the Ahmedabad diocese of the Swaminarayan sect. According to the document prepared by Shree Hari about the Divisions of the sect on the basis of regional consideration. Ayodhyaprasadji Maharaj was given this responsibility by Shree Hari to place it in to act. He was born in the Chapaiya village. 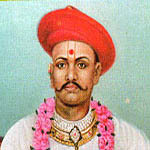 His father Rampratapji Pande was the elder brother of Shree Sahajanand Swami. He was very polite and humble by nature. He was never affected by any sense of pride or position. His long and continuous association with Shree Hari resulted in numerous qualities revealing him. His self-righteousness and sense of realisation was always at its peak. Once Acharya Maharaj was deeply engrossed in worship of Bhagwan, in the ritual known as 'Manasipooja' at Avadhbhuvan. He transcended all bodily sensations and even his physical existence. Meanwhile, a scorpion crawled on his back and in spite of several bites, which left reddish scars, he continued with his worship without a shudder. It was only after an hour or so that he felt the sensation of an insect bite. The devotees were shocked at the painful sight. But the Acharya Maharaj pacified them by saying that every creature behaves according to its nature and personality. The scorpion did the same. We as humans should behave like human beings. He was perhaps the finest example of the human qualities of flexibility, and absorption in matters related to the spirit. Acharya Maharaj selected his son Keshavprasadji Maharajshri as his successor to the seat. He served the diocese for 42 years and brought glory to the sect. His life and times are characteristics of the legendry age of the Swaminarayan sect. He was a bit short-tempered by nature. But that never obstructed his performance as an Acharya. He was equally loving by nature. He always encouraged learning and the learned. He used to keep the company of learned sadhus and saints whenever he undertook a religious trip. Acharya Maharaj served the seat for nearly twenty-two years. He selected his son Purshottam Prasadji Maharajshri as his successor to serve the seat. The third Acharya of the Shree Nar-Narayan Dev Gadi, Purushottamprasaddasji Maharaj, through a little hot in temperament, was very much loving and expressive by nature. It was difficult for him to tolerate an iota of dishonor towards worship and devotion. He used to move around various towns and villages with a view to propagating the ideals preached by Shree Hari. He encouraged literature and creativity. He also inspired different constructions and architectural works at various temples. He was very energetic in creating wealth for the temples, so that the survival and maintenance of the temples would never be adversely effected. Purushottamprasaddasji had no progeny of his own. 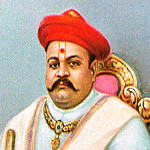 Hence, he adopted Vasudev Prasadji Maharajshri, the son of Kashiprasadji Pande, a member of the Dharma Kul (Shri Hari's Ancestry) and made him his successor. He served the seat for nearly twelve years, before he passed away. Acharya Vasudevprasadji toured various towns and villages of the northern region along with distinguished group of learned saints, singers and other devotees. Many a villager still recollects the happy memories of those golden days. The Swaminarayan sect has paid homage to him as a legend of all times. Acharya Maharaj served the seat for 36 years. He selected his son Devendraprasadji Maharajshri as his successor to serve the seat. A son of Acharya Vasudevprasadji Maharaj, Devendraprasadji was born in Ahmedabad on the auspicious day of Sharadpurnima. He was just like an incarnation of the full moon with a cool head, calm heart and many other virtues. Under his able stewardship, the devotional pursuits of the Swaminarayan sect increased by leaps and bounds. 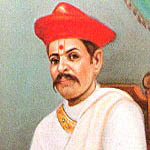 Devendraprasadji had studied Sanskrit at a very young age. He could compose verses in Sanskrit. He was equally at eases with Prakrit (Gujarati) and English, and music was a great part of him. Though he was seemingly not very strong physically, his stamina and will power were proverbial. He could undertake the most arduous tasks with ease. He was also a great patron in literature. The Gujarati translation of three Holy Scriptures 'Satsangi Jeevan' and 'Hari Krishna Lilamrit' is available to us only due to his efforts and encouragement. It is believed that the bulk of the religious literature produced during the tenure of Acharya Devendraprasadji has no parallel in the history of the sect. He was keenly interested in the promotion of education, and formed the Devendraprasadji Education trust. 'Sahajanand Arts and Commerce Colleges' are its offshoots. He has three sons and two daughters. 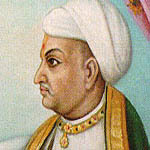 The eldest of these, Tejendraprasadji Maharajshri, was handed over the reins of the Swaminarayan sect. The Acharya of the NarNarayan Dev Gadi, Ahmedabad, H.H. 1008 Shree Tejendraprasadji Maharajshri was appointed by his father, the Late Acharya Maharaj 1008 Shree Devendraprasadji Maharajshri. His Holiness was enthroned as Acharya on Aaso Sud 2, Vikram Samvat 2025 (13 October 1969). His Holiness took up the responsibilities of the Sampraday on the orders of Acharya Shree Devendraprasadji Maharaj from the tender age of 14 years. Accompanied by learned saints, His Holiness traveled to East Africa to nurture the Satsang there. Following steadfastly in the steps of his Great Grand Father, His Holiness gave up his further studies to care for Acharya Maharajshri Devendraprasadji Maharaj in his days of ill-health - just as Ghanshyam Maharaj had cared for His parents in their times of ill-health. His Holiness is always kind, peaceful, just and loving towards all. Despite all the pressures of the ever-expanding Sampraday, one never witnesses a sign of fatigue on his body. Neither does His Holiness turn down requests from followers to attend festivals, padhramnis, etc. Ably supported by H.H. 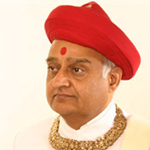 Lalji Maharajshri (Acharya-Designate) Koshalendraprasadji Maharaj, who has incidentally taken up much of the Satsang propagation duties, Acharya Maharajshri now instills the same ideals of Satsang seva in his grandson, Bal Lalji Maharajshri Vrajendraprasadji Maharaj. In over 30 years of tireless service to the Sampraday, His Holiness' accomplishments are too numerous to list here. The following is but a summary of the facts detailed in 'Dharma Setu', His Holiness' biography produced in 1994 during the Silver Jubilee & Golden Jubilee Festival. Gurukuls/Sanskar Dhams : Located at Asaarva, Abu, Jhilvana, Gandhidham, Kalol, Jetalpur, Koteshwar, Mandvi, Chiloda, Idar, Rampur, Saayla, Siddhpur, etc. International Swaminarayan Satsang Organization (ISSO) : His Holiness established the ISSO on Vijya Dashmi in 1978 in USA. Today, the organization spans the world with active groups in all the continents. It is particularly active in USA & UK, where regular camps and conferences nurture the young and mould them into worthy satsangis of the future. Bhagwan Shree Swaminarayan's 200th Birthday Celebrations : 1981 saw numerous celebrations to commemorate The Almighty's Bi-Centennial birthday. The largest of these were at Ahmedabad, Bhuj & Muli. The renowned Pundit Late Dongreji Maharaj recited the Shreemad Bhagwat Katha at the Ahmedabad festival where hundreds of thousands of devotees gathered. A few days later, His Holiness traveled to Kutch and presided over the festival in Bhuj, under the able stewardship of the resident saints. This was soon followed by the event at Muli, which was celebrated with grand pomp. His Holiness Acharya Maharajshri's Silver & Golden Jubilee Festival : In 1994, His Holiness completed 25 years as an Acharya of the Northern Zone & reached his 50th birthday. The Sampraday came together to celebrate this momentous occasion with His Holiness. Never one to think of himself first, His Holiness ordered that any funds raised from the event should be used to re-construct the dilapidated temple at the birthplace of Bhagwan Shree Swaminarayan, in Chhapaiya. The followers, always eager to fulfill all His Holiness' wishes, did just that. Today, the temple re-construction is complete. The new temple now stands proudly as a testament to Shreeji Maharaj's glory. H.H. Lalji Maharajshri correctly taught us during the Silver & Golden Jubilee Festival, to pray to Bhagwan Shree Swaminarayan that we should never ever be without indebtedness to His Holiness Acharya Maharajshri. His Holiness' sacrifices for this Sampraday and us satsangis are beyond contemplation. Long may you (H.H. Acharya Maharajshri) lead us out of the darkness of spiritual ignorance and away from the temptations of this material world. Sanatan Dharma Dhurandar Acharya Maharaj Shree 1008 Koshalendraprasadji Maharaj (October 1971 - Present) is the current Acharya of the NarNarayan Dev Gadi of the Swaminarayan Sampraday (15 October 2004 - Present) and is the 7th spiritual successor of Swaminarayan in the North Diocese (NarNarayan Dev Gadi, Ahmedabad). The establishment of Shri NarNarayan Dev Yuvak Mandal (NNDYM) has been a major achievement of Acharya Shree Koshalendraprasadji Maharaj. Festivals have been celebrated on a scale never before seen in the Swaminarayan Sampraday under the leadership Acharya Shree Koshalendraprasadji Maharaj, including the Shardha Satabdi Mahotav, Shashti Purti Mahotsav and the Chhapaiya Nij Mandir Pran Pratishta Mahotsav. An initiative taken by Koshalendraprasadji has been the Jai Shree Swaminarayan television serial that has been broadcasted throughout the world. According to the followers of the Swaminarayan Sampradaya, Acharya Shree Koshalendraprasadji Maharaj is very humble. His philosophy of working centres on the principle that everything can be achieved if we surrender ourselves to the lotus feet of Bhagwan Swaminarayan. All tasks, no matter how daunting they may seem at first, can be fruitful and filled with utmost success if performed with Bhagwan Swaminarayan in mind. NarNarayan Dev Yuvak Mandal (NNDYM) : His Holiness established branches of the NNDYM all over the Northern Zone, under the careful and calculated guidance of H.H. 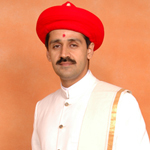 Lalji Maharajshri (Acharya-Designate) Koshalendraprasadji Maharaj. The organization's membership exceeds tens of thousands of youth from all backgrounds - students, professionals, businesspersons, etc. tree planting, blood donation camps, religious camps, conferences, seminars, workshops, etc. and processions are but a few of the activities undertaken so far.